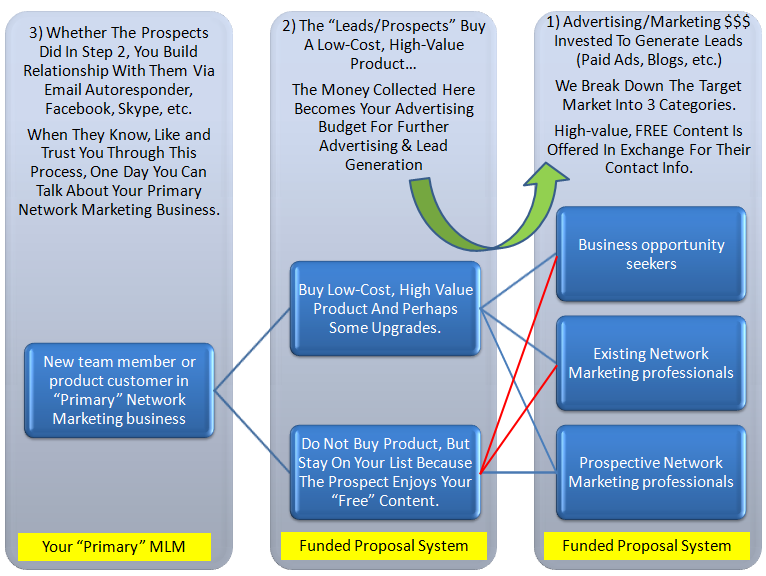 You are here: Home / Attraction Marketing / Is funded proposal the key to exploding profits and downlines? Years ago when I first got started in the home business industry I was working in an aerospace company as an engineer. I was making a decent salary comparing to the rest of the engineers with my experience in the aerospace field. I didn’t have any problem putting a few thousand dollars into my business because I knew it was an investment and I had the cash. However, as I continued to learn more about business and contacted more people about going in business with me, I quickly found out that getting the cash together for most people to start a business is a real challenge, even in the home business industry where anyone can usually start for less than $1,000! And then the next biggest challenge surfaces… and it’s called promoting the business! Now, what is a committed home business entrepreneur to do if he’she is low on cash? A good number of them have discovered this method called “funded proposal” which takes them leaps and bounds beyond what conventional training provided by most network marketing corporations and field leaders. What is a Funded Proposal anyway? Funded proposal, when applied to the network marketing industry, is the idea that a marketeer recruits as many other potential network marketers as they can by taking them through a training program that is highly valuable to them and helps them set up and build their businesses… and then these these people are added to the recruiter’s team. The biggest and most critical difference between funded proposal and the typical prospecting process is that the new network marketer who is recruited must now invest a small fee to obtain their high-value (but low-cost) training or service. The recruiter can then use the money collected to cover the initial advertising costs to obtain the new recruit and other prospects or bridging the funding gap that comes with slow-moving products. By charging this fee, you now have the leverage to continue advertising, getting more leads onto your prospect list, and training as many people as possible who will eventually turn into product/service users and business builders in your business without you taking money out of your own pocket. This is truly a win-win scenario! This way you do not have to rely on the money that your hire may or may not make for you in the future. Instead you can use the money the new hire has paid for training which should satisfy your present needs until you can attract future prospects. It’s this that gave birth to the funded proposals and it has been demonstrated to be a very successful technique as it takes care of its own costs as it grows. It is however significant to attempt to ensure that the amounts you charge are not that much for the new sign ups as this may turn 1 or 2 folks off and jeopardize your attempts. As much as this option works very well at the initial stages, excellent product information is awfully crucial and making sure that you’ve got the right candidates who can convert the training into potential leads and presumably sales is the sole sure way of growing. It is however calculated that many people who see the possibility after your training in numerous cases will grow into good marketers with higher sales to sustain the business thus the great success of the funded proposals. There are a good number of funded proposal systems that you can leverage to build your business today. A few of them are reputable and reliable, but only one that we have invested our own money into testing to be the most reliable, profitable and valuable for generating commissions and leads for business. The system is called Empower Network, and it is completely turnkey and pays 100% commissions from its products to its affiliates. Our team has been able generate over 1,000’s of leads and over a quarter of a million in commissions just over a 12 month period that began on November 1st, 2011 and still collecting around $30k a month in commissions from it. Take a look at this video to learn more about Empower Network, the funded proposal system of our choice.